Do you ever get the urge to throw everything into your car and just go somewhere? Sometimes you don’t want all the hassle of preparation, planning, you just want to hit that open road. 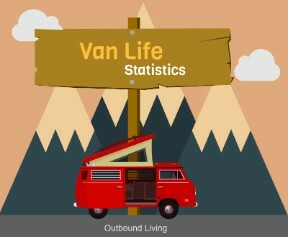 One easy way to do this is to hire/rent a camper van, a van that comes fully stocked with everything you need for a road trip, which is where companies like Nest come in. And although their Cuckoo is a pretty small van it’s ready to take on some seriously big adventures. Nest’s Cuckoo camper and their travel guides are designed to capture the imagination. 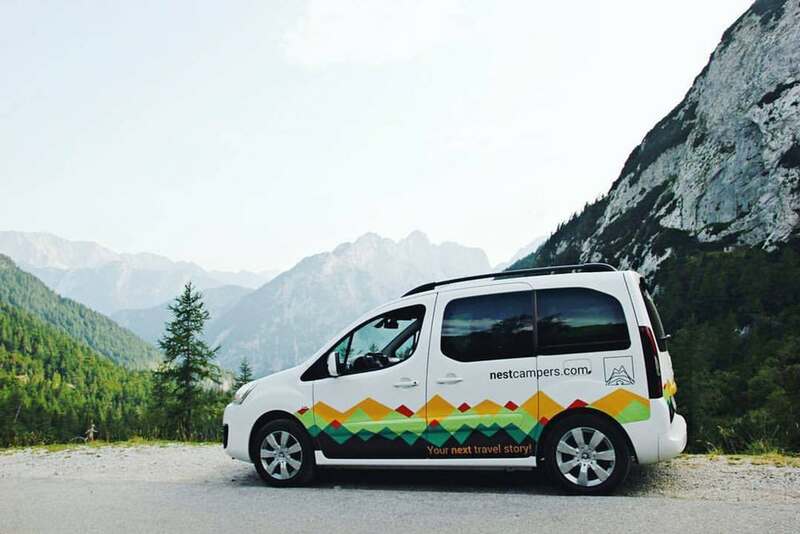 Nest is a company based in Slovenia, the heart of Central Europe with its Alpine mountains, deep blue lakes and stunning driving routes. 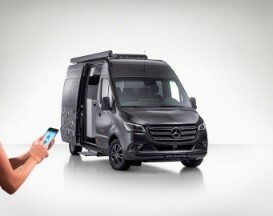 At the moment they have just two types of vans available for hire: the Cuckoo minivan, and the medium wheelbase Stork, but they both come with unlimited mileage, a Slovenian vignette and green card insurance that covers you in any European country. This means that they can be taken on anything from a weekend getaway to an epic multi-country road trip, as a couple or with the whole family. The Cuckoo is based on a 2017 Citroën Berlingo Multispace with a 1.6L engine and an automatic gearbox. Amazingly, Nest claim that their camper van can deliver up to 5.5L/100km in fuel economy, that’s 51mpg. It’s got cruise control, hill-start assist, automatic AC and parking sensors to make driving safer, as well as an infotainment system with USB and Bluetooth connectivity, and even a voice recognition function. You’ll find roof racks on top for hauling gear, tinted glass on all the back windows as well as a sunshade for the rear. The Cuckoo is ready to take up to four people on a Europe-wide adventure. 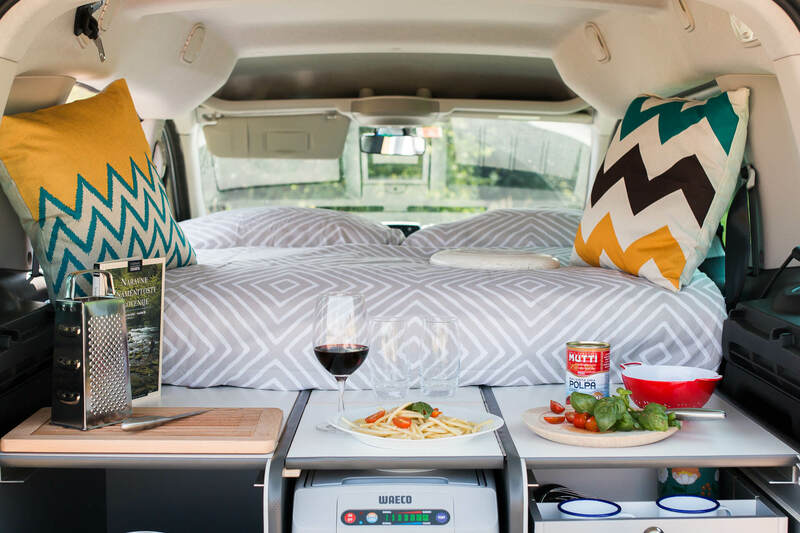 Moving inside, the interior is cozy and vibrant, with the large double bed taking up most of the space when unfolded, and a compact, modern kitchen accessible from the tailgate. It seats four and sleeps two with the option of a third person at the rear of the van, or as many as you like with the addition of a tent. The Cuckoo is designed for outdoor living- you won’t find an indoor dining area or a bathroom, but outdoor seating is provided with the aim of getting you closer to nature. 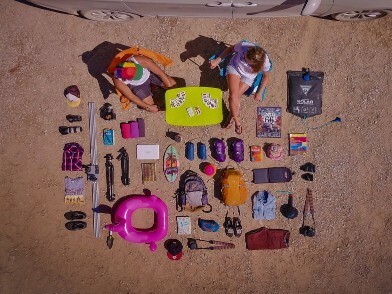 Nest even includes a camping light, CEE plug, a power extension plug, playing cards and a frisbee, and they can throw in a whole range of extras like a power inverter, a solar shower, snorkeling gear, kayaks and bikes, all for a variety of extra fees of course. Outdoor living kept simple; the Cuckoo’s outdoor dining set. 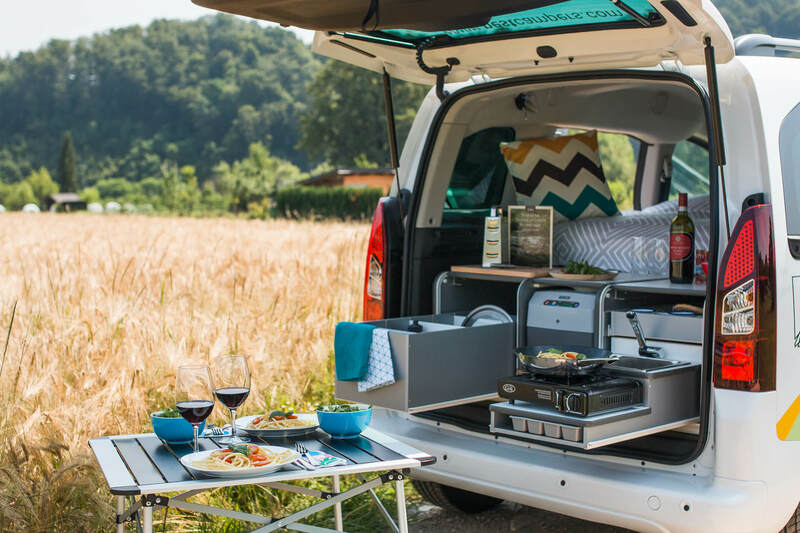 The Cuckoo was created primarily as a two-sleeper van, but it does have the option of incorporating a third person on an extra expandable bed that sits on top of the rear kitchen boxes and folding rear seats; these can be removed optionally if the van is being hired by a couple. The company provides duvets and pillows for the slightly larger than average double bed, and 12V interior lighting gives you something to read by at night. The large double bed takes up most of the van’s interior. 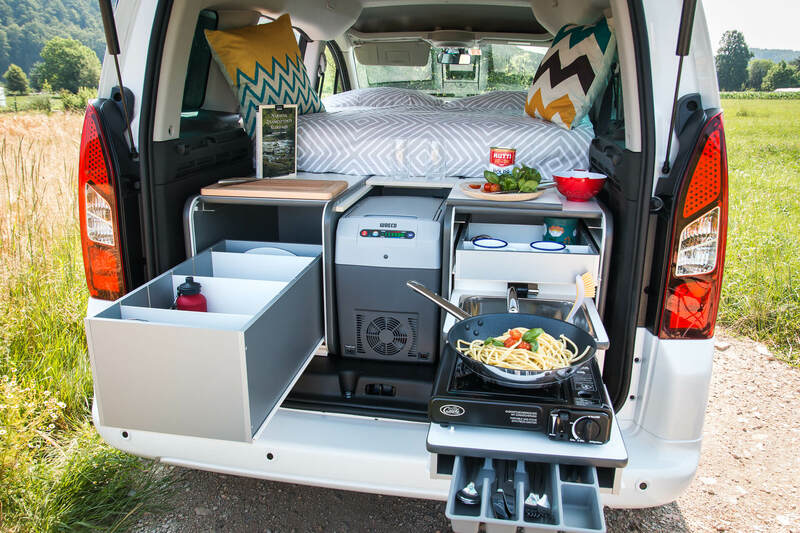 The amount of equipment they have managed to fit into such a tiny kitchen is quite frankly astounding; you won’t miss a thing cooking up a hot meal in the evening from your tailgate, or brewing up your morning coffee with a view. It’s got a one-ring gas cooker, a small sink with fold-away tap and drain fed by a 13L freshwater tank and collected in a 13L grey water tank. There’s even a 20L Waeco compressor fridge stashed away in there, and all the kitchen utilities you could want, as well as a camping cookbook, a coffee pot and enamel mugs for those Instagrammable morning coffees. 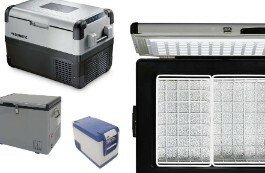 Despite its size, the Cuckoo’s kitchen has got everything you need. 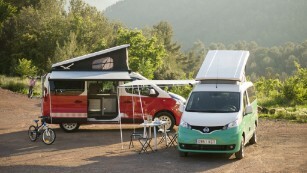 If a camper van with such a small footprint isn’t your bag, or maybe you have a family or some mates you want to bring along, then you might want to consider upgrading to Nest’s larger Stork camper based on a Citroën Jumper 2017, which sleeps four and has an indoor kitchen, diner, a double bed and two singles. 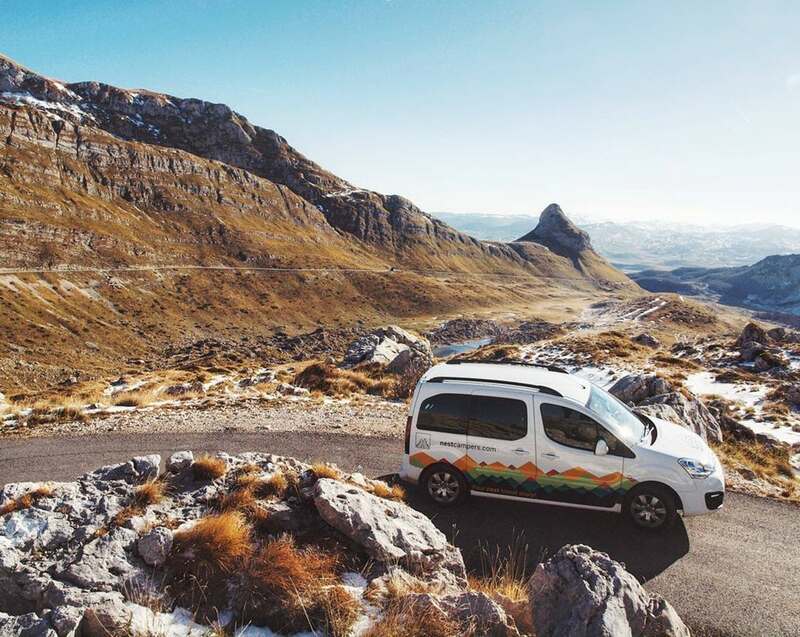 With its incredibly economical mileage, insurance that covers you across the whole of Europe and a vignette thrown in for Slovenia’s highways, this camper van works out cheaper than a hotel room, and pretty cheap compared to embarking on a trip in your own camper van when you consider what’s included, as hire starts from just €57 ($65) per day. Of course if you want to throw in some adventure gear, roof storage or an awning that price is going to go up, but for someone who wants that little taster of vanlife and the freedoms that come with it, this is a deal that’s too good to pass up. Two young Cornish photographers roadtripping around every country in Europe in our self-converted LDV Convoy.